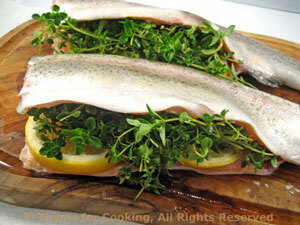 I love the lemon thyme in my garden, but regular thyme will work just as well with the fish. This is the hub's specialty.... From the Joy of Cooking. He has left out the raw egg on occasion, and it worked fine without it. Anchovies are classic - but it's still good without them, as well. If you use the raw egg, it's easiest to use your hands to mix the salad. Earlier in the day or the night before: Peel garlic, cut each clove in half and put it, along with 1/4 cup olive oil, into a small glass dish or glass measuring cup. Cover with cling film and set aside to steep. When ready to use, remove and discard garlic. Or use it for something else. The croutons: Heat 2 tbs of the garlic oil in a nonstick skillet. Add the bread cubes and sauté until golden. The lettuce: Wash and spin-dry the Romaine. Tear it into large bite-size pieces. The salad: Mash the anchovies in the bottom of a large salad bowl. Add the salt, pepper, mustard, Worcestershire, vinegar, remaining garlic oil and mix lightly with a fork. Squeeze the lemon half over, sprinkle with Parmesan and mix lightly again. 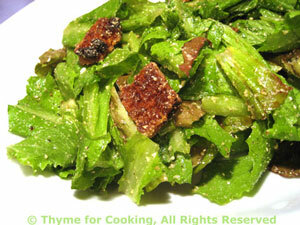 Add the Romaine and toss well with tongs or salad forks. Add the croutons, toss a bit more. At this point, if you are using the egg: Crack the egg into a small bowl and break the yolk. 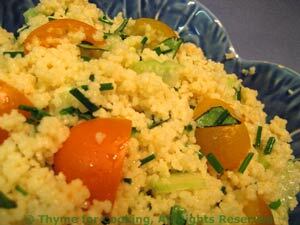 Add it to the salad and toss well to mix, hands work best but a tongs will do. Serve immediately. 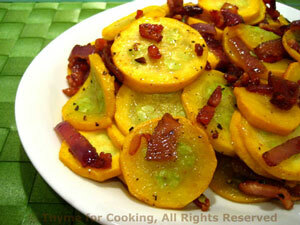 A bit of salty bacon and sweet red onion adds big flavor to simply sautéed summer squash. Slice the blossom end off of the squash, then slice it into 1/4 inch (.5 cm) rounds. Add bacon and sauté until crisp. Remove and set aside. Remove all but 2 tsp fat from skillet. Add onion and sauté until tender and starting to brown. Add squash slices and stir fry until they just start to soften. Crumble bacon and add to squash. Cover, remove from heat and let rest 1 - 2 minutes to finish. Stir and serve.